It must be strange, being a defender of historic greatness for a solid decade, starring for arguably the greatest club and national teams of all time, and still winding up somehow underrated. 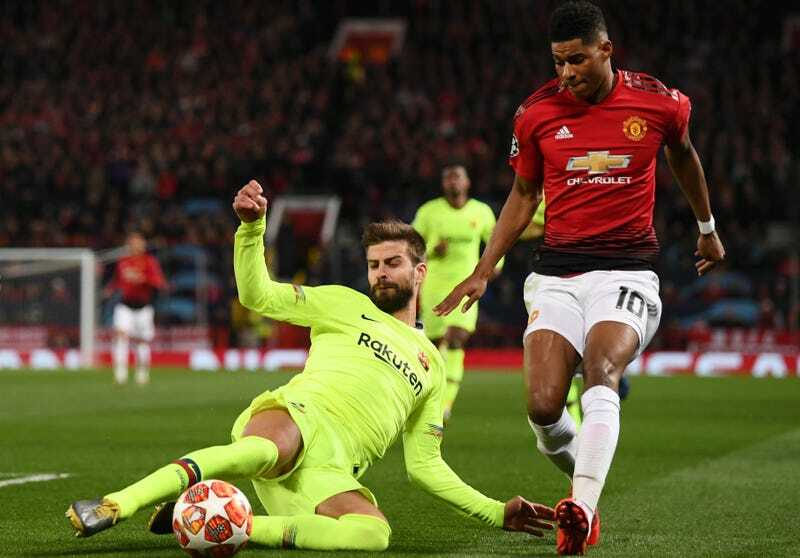 And yet, that is the fate of Barcelona and Spain center back Gerard Piqué—though if he continues to put together heroic performances like yesterday’s against Manchester United, he might finally start receiving a modicum of the appreciation he deserves. Despite giving up a quick opening goal, Manchester United did not make it easy for Barcelona at Old Trafford on Wednesday in the first leg of a blockbuster Champions League quarterfinal tie. United came in with a smart game plan focused on taking advantage of their athletic superiority by bullying Barça with strength and speed. After the opening jitters went away, United were the better side for much of the game, their pressing and pace gunking up Barcelona’s possession and regularly victimizing the Spanish giants on the break. The most stunning stat is that, somehow, Piqué didn’t commit a single foul all match. Every tackle, clearance, and header was inch-perfect, stopping United attacks in the box before they could bother Barcelona goalie Marc-André ter Stegen. United attacked well all night, and yet Barcelona were never truly threatened (the Red Devils didn’t muster a single shot on target). No one deserves more credit for that than Piqué, Barça’s miracle worker. Performances of this type are nothing new for Piqué this season. While Liverpool’s Virgil Van Djik has been feted (not incorrectly so, mind you) all over the place for his ascendant defensive showings, Piqué has been the anchor of a Barcelona defense that would have certainly come unmoored without him. Alongside Clément Lenglet—a perfectly good defender whom Piqué, channeling his inner Carles Puyol, has helped transform into a world beater—Barcelona have a central defense that is one of the most consistently exposed pairings in the elite European game and yet also somehow one of its strongest. Lionel Messi is the reason why Barcelona are who they are, this year and every year, but Piqué is easily the second-best and second-most important piece in a team that is regularly one of if not the best in the world. On Wednesday, Piqué returned to his old grounds—he left Barcelona in 2004 for United, before returning to the mothership in 2008—and showed them what they have been missing over the last decade. Everyone, Barça fan and United supporter alike, came to the stadium to watch in fear and/or awe of what Messi might do with the world’s attention on him. Instead, it was Piqué, the only other true superhero on the pitch, who put on a performance to be remembered. A performance that proved that even if too few recognize him for it, Piqué is still one of a select few who qualify as the game’s true greats. Who The Hell Is Going To Win The Champions League?